Strolling through Midtown Manhattan’s Garment District, passersby can encounter art just by running their everyday errands. All pedestrians have to do is look up! 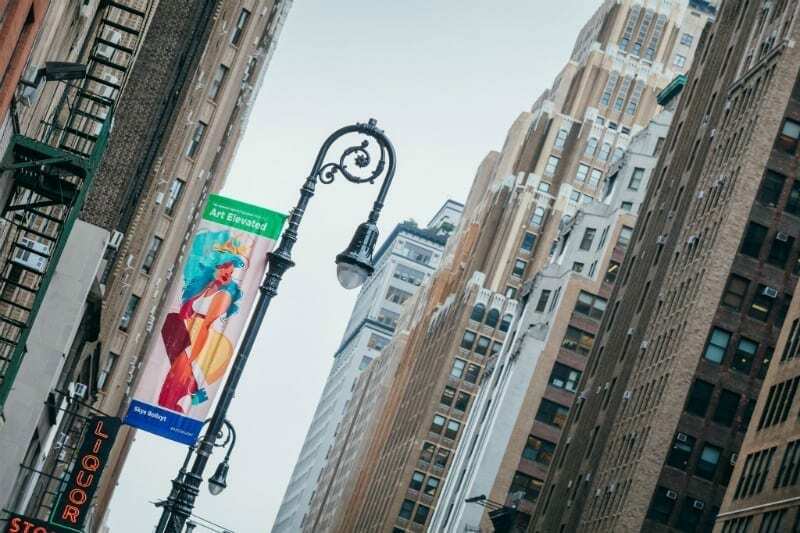 Art Elevated, a joint exhibition between Orangenius and the Garment District Alliance with additional sponsorship provided by ImageRights, features dozens of stunning artworks displayed on banners strung up across the Garment District in Midtown Manhattan. On view through October 31st, more than eighty artists – including three top prize winners – are on view, prominently brightening up the city streets. 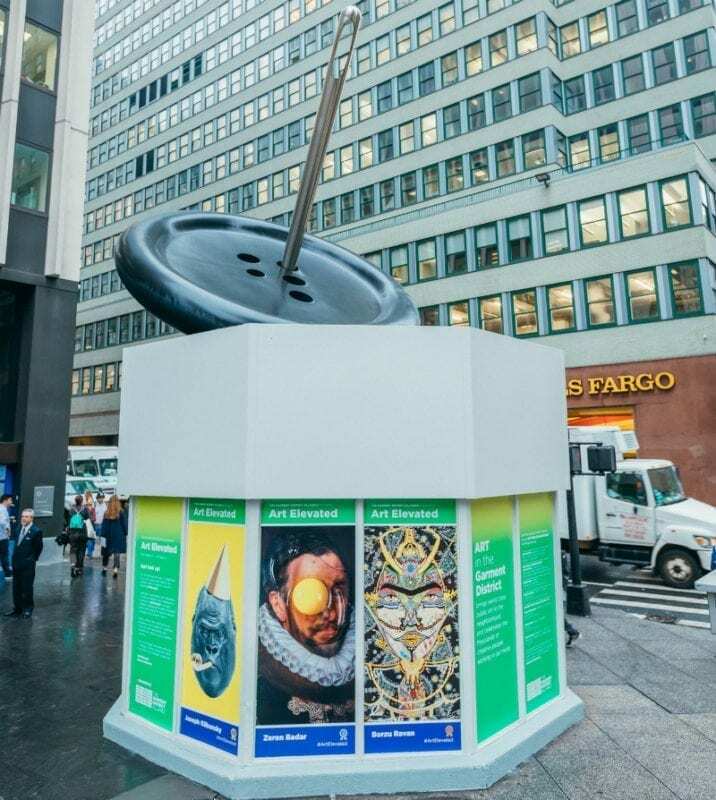 This open-air art exhibit stands as a tribute to the 15th anniversary of the Garment District’s Arts Festival. In addition to prizes, new fans inspired by this exhibit can easily locate their favorite artists on the Orangenius platform, and even have the opportunity to collect their artworks in the Orangenius marketplace! Selected by esteemed jurors including Bill Carroll at Elizabeth Foundation for the Arts’ Blackburn Printmaking studio, Melanie Vote from New York Academy of Art and Jerry Weiss from the Art Students League, the finalists featured in Art Elevated include selections ranging from figurative art to colorful abstraction. 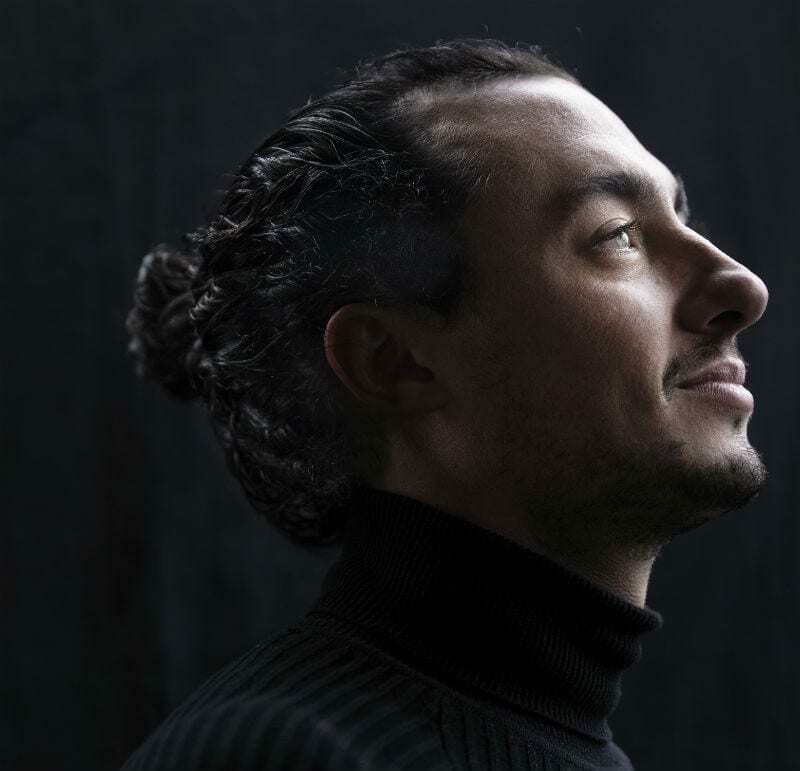 First prize winner, Joseph Klibansky, lives and works in the Netherlands. Second place winner Zeren Badar, originally from Turkey, lives and works in Brooklyn, NY, while Third place winner Borzu Razan is a self-taught artist also based in Brooklyn. We talked to our Top Prizewinners to learn more about their practice and their interest in Art Elevated! Joseph Klibansky (b. Cape Town, 1984) is a contemporary artist based in the Netherlands whose iconic Neo-Pop stylings have propelled him to international acclaim. His artistic practice blurs the thresholds between collages, digital photography, painting, and sculpture. 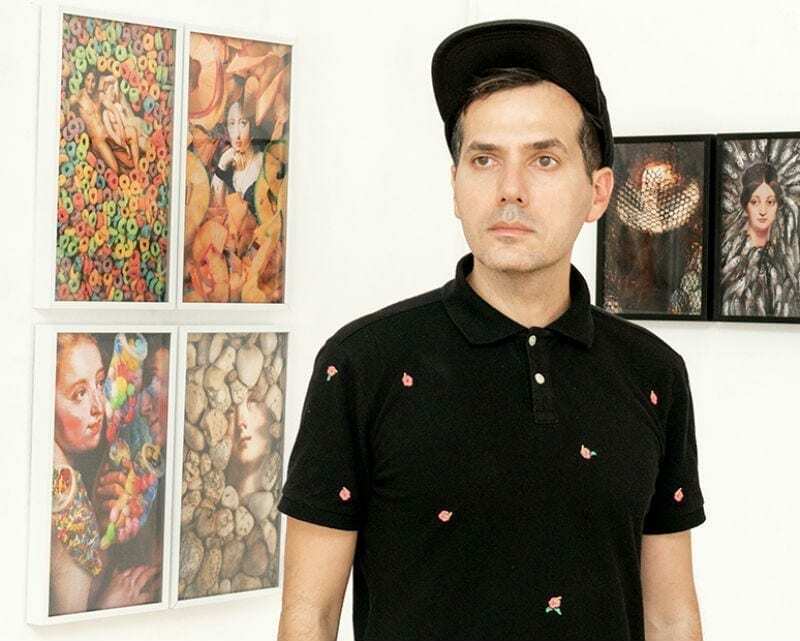 Digital technologies and computer art have been integral to his life and practice, forming a common denominator of his artistic process and a methodology to his practice beginning in 2006. Starting from 2011 Joseph Klibansky has been working on sculptures and environmental installations usually made with precious materials, such as polished bronze and gold leaf. Part of Klibansky’s artistic process pivots around contemporary symbols taken from our contemporary, visual culture. Klibansky notes of his work, “symbols are like icons on a smartphone: a quick way to communicate, they are connected to the time we live in, where everything has to be faster and more condensed than in the past”. Klibansky notes that his artwork for Art Elevated is based on a sculpture of the same name that he transformed into a screenprint. His use of the yellow background allows this work to be, in his words, “realistic and surrealistic at the same time… (and) putting on a yellow background, it really stands out from a distance. I knew it would be seen from far away and I wanted the impact!” Klibansky’s work will be on view at Art Miami this December, following a group show in Los Angeles in November along with a concurrent exhibition in Jing’an sculpture park in Shanghai this winter. Zeren Badar is an NYC-based self-taught conceptual artist living in Brooklyn. Originally from Turkey, Badar is influenced by art history, Dada & Pop Art. He is very interested in making works based on memory, identity, and everyday objects. His works have been exhibited internationally included shows at Aperture Foundation, New York; The Center for Fine Art Photography, Fort Collins, CO, and the Griffin Museum, Boston, among others. 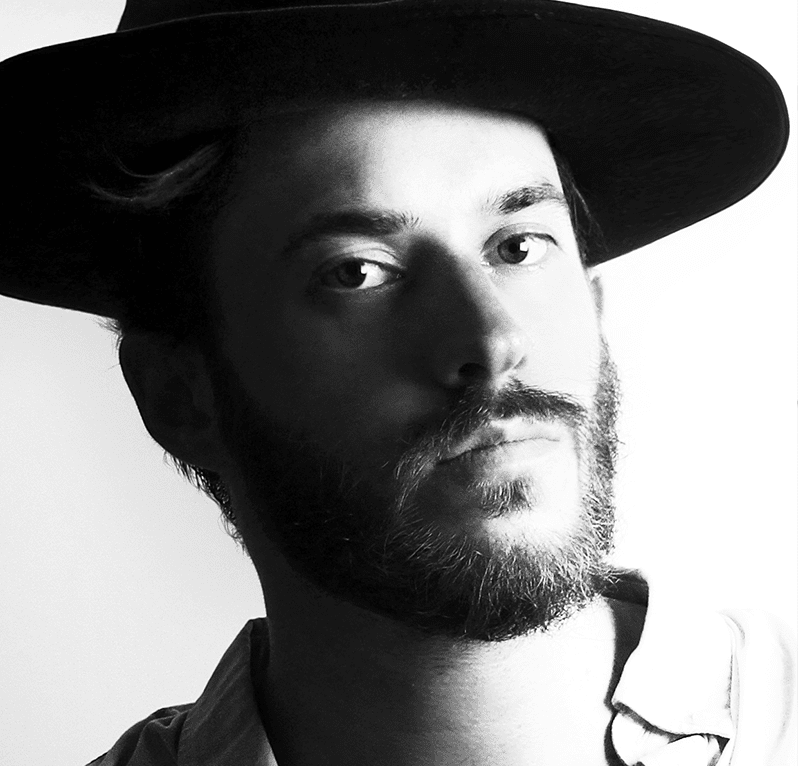 His works have been featured in Marie Claire, Neon Magazine, Fahrenheit Magazine, and more. When envisioning his work as part of Art Elevated, Badar notes the impact the Garment district has on his practice. ” The Garment District has a very important meaning in my life, as I have been working in fashion for decades. I’m there almost every day.” Badar notes that the color of bright yellow egg yolk juxtaposed against a bright blue sky would give pedestrians something to admire. “The color of yolk is very warm; this contrast makes the artwork very interesting. It is a head turner.” Badar is currently engaged in a multi-disciplinary project, “I said YES so many times,” that explores issues related to immigration and employment in the US. He is in the early stages of producing a pop-up show around this body of work.